... You have SPYWARE, ADWARE or MALWARE on your PC! Spyware, adware and malware are computer programs that invade your privacy. Certain spyware tools fill your desktop with thousands of icons for pornographic sites. Others steal your private data and send it to hackers via the Internet. Spyware it NOT rare. The average computer in infected with a massive 28 SPYWARE/ADWARE/MALWARE tools! (Source: EarthLink “Spy Audit”). However most spyware scanners simply WAIT for the problem to occur BEFORE they sort it out. Spyware IT proactively monitors your PC around the clock, preventing issues BEFORE they even happen! Plus, with it's massive database of almost 100,000 known threats and FREE lifetime updates, Spyware IT officially ranks the most competitive spyware removal tool available. Scroll down to learn more -- or click here to view screenshots. Spyware IT offers TOTAL protection against 100,000 threats! 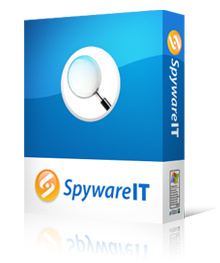 Rated the #1 spyware remover, with over 10,000 downloads every week! Including Protection from 100,000 Predators & FREE Updates! Instant scanning and removal of all the latest spyware and adware threats. All it takes is a couple of clicks and you’re protected! Unlike rival software, Spyware IT proactively monitors for in-memory spyware and homepage hijacking – and deals with it for you! Spyware IT constantly scans the Windows registry, running processes, Internet cookies & more, for total privacy protection! Absolutely 100% FREE LIFETIME UPDATES! When you purchase Spyware IT, you automatically receive FREE updates for life. There are NO hidden fees and NO monthly membership costs! Provides MORE PROTECTION than OTHER spyware tools! Spyware IT Officially Ranks as the #1 Spyware Remover! Interested in how Spyware IT matches up with others in the industry? Buy Before Midnight for JUST $27.95! The main Spyware IT program, offering total spyware, adware and malware protection. Includes real-time scanning and full system restore capabilities! spyware definitions, FREE of charge - for life! including a FULL copy of Anti Identity Theft & our FREE 30-PAGE guidebook! Enjoy FULL versions of our exclusive popup blocker and IP messenger blocking tools. Worth $19.95 EACH! and turbo-charge your Internet connection! We’ll explain how to get your hands on the latest firewall and virus tools. It's totally legal and completely FREE of charge! YOUR copy at our SPECIAL $27.95 offer price! If you wish to pay by PayPal, please click here. Download links sent instantly. Total cost will be $27.95 converted to your local currency (that’s around £17.95 or 20.95 Euros). Note that Spyware IT is a Windows-only application. OFFER MUST END SOON. FIRST COME FIRST SERVED BASIS APPLIES. Want more info? View Spyware IT screenshots by clicking here, or read our FAQ by clicking here. Want your version of Spyware IT on CD-ROM? Please click here to purchase for just $42.95. so you can started straight away! Home | Screenshots | FAQ | Testimonials | Affiliates | Contact Us | BUY NOW!